Jo-Wilfried Tsonga defeated Roger Federer 7-5, 7-6 (3) to win the men's singles title at the Rogers Cup Sunday in Toronto. It's Tsonga's first victory at the tournament. As a No. 13 seed, Jo-Wilfried Tsonga had a punishing draw at the Rogers Cup. He didn't have big expectations entering the tournament but proceeded to take down some of the biggest names in tennis en route to the final. Once he got there, arguably the greatest player in the sport's history became his latest victim. Tsonga relied on his powerful serve and strong baseline game in a 7-5, 7-6 (3) victory over second-seeded Roger Federer at Rexall Centre on Sunday. The Frenchman took advantage of a rare off-day from the Swiss great and capitalized on his chances. "I'm working hard, my motivation came back," said Tsonga, who has battled knee problems over the last two years. "I want to win, I want to play my best tennis on the court. And it happened today." It was his fourth straight victory over a top-10 opponent. He upset top-seeded Novak Djokovic in the third round, eighth-seeded Andy Murray in the quarter-final and seventh-seeded Grigor Dimitrov in the semifinal. Tsonga earned $598,900 US for winning the $3.78-million tournament while Federer received $293,650 as the finalist. It was Tsonga's second career Masters 1000 Series win and his first victory at this event. He took out three members of the so-called Big Four this week. The other, 2013 champion Rafael Nadal, withdrew due to injury. "I think for me it's going to be a new motivation because just last year I always lost against those guys and it was really frustrating for me," he said. "Then today a win against (Federer), it's good for me, it's good for my ambition and it's good for my career." Federer, a 17-time Grand Slam champion, was his usual consistent self in a semifinal win over Feliciano Lopez a night earlier. But he had a hard time with the quick turnaround to a mid-afternoon start on a glorious summer day. 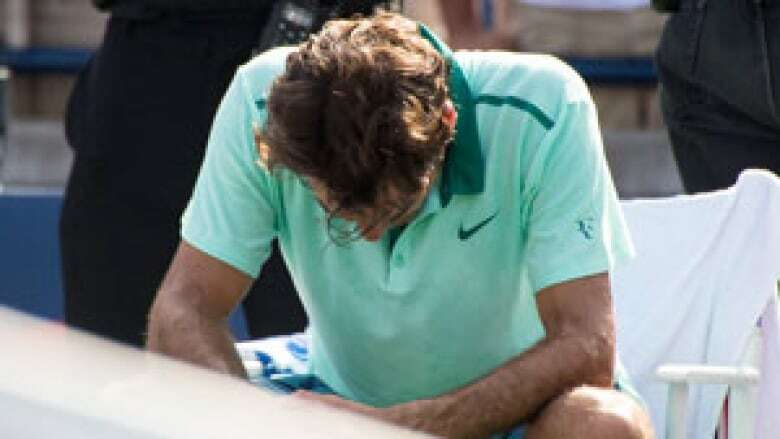 "I fought, I mixed it up and I was hoping to sort of sneak in a set and then maybe he would get a bit nervous or maybe would play a bad game," Federer said. "But I just couldn't create enough opportunities. So I think he deserved to win at the end of the day. "It was pretty simple, in my opinion." The first set was a rather choppy affair. Both players made some unforced errors over the first few games but each held serve. Tsonga struggled with his first serve at times but his spin-heavy second serve was just as effective. The quality of the match picked up late in the set. With Tsonga serving at 5-5, Federer showed his skills at the net with a deft drop shot that a fully-stretched Tsonga could not retrieve. Tsonga's serve picked him up and he earned the hold to put the pressure back on the world No. 3. Federer became unglued in the final game, spraying two shots long to fall behind 15-30. He pulled even with a winner but was wide with a ground stroke that was unsuccessfully challenged, setting up the first break point opportunity of the set. The Swiss star then launched a ball well long to give Tsonga the opening set in 44 minutes. Tsonga, who reached No. 5 in the world rankings in 2012 but is currently No. 15, kept the pressure on in the second set. He had a break point chance with a 3-2 lead but Federer came back with an ace and fought back for the hold. The Frenchman had another great chance up 4-3 with a double-break point. However, Federer answered again with two straight points to get to deuce and then saved two more break point chances before holding with an ace. In the tiebreaker, Tsonga picked up a mini-break for a 4-3 lead and took the next three points for his first ATP title of the season and 11th of his career. Earlier, Bruno Soares of Brazil and Alexander Peya of Austria successfully defended their doubles title with a 6-4, 6-3 win over Ivan Dodig of Croatia and Marcelo Melo of Brazil.